Nobody likes uncertainty. It gives us the jitters. And ever since the Referendum some people have been getting jittery about the future of the new power station. I was always convinced that it would proceed whatever the outcome of the vote, but some (especially in the national media) had doubts. Well today I think we can put aside all doubt. The new man with the money in the new Government of Theresa May has laid his cards decisively on the table. 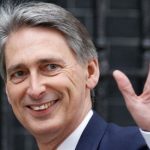 Philip Hammond the Chancellor is unequivocal: Hinkley is vital – it will definitely proceed. Three cheers for that!